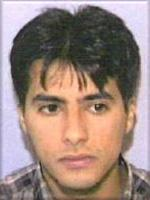 Ahmed bin Abdullah al-Nami (Arabic: أحمد بن عبد الله النعمي, Aḥmad bin ‘Abdullāh an-Nāmī; also transliterated as Alnami; August 17, 1977 – September 11, 2001) was one of four hijackers of United Airlines Flight 93 as part of the September 11 attacks. Born in Saudi Arabia, Nami had served as a muezzin and was a college student. He left his family in 2000 to complete the Hajj, but later went to Afghanistan bound for an al-Qaeda training camp where he befriended other future hijackers and would soon be chosen to participate in the attacks. He arrived in the United States in May 2001, on a tourist visa, where he would settle in Florida up until the attacks. On September 11, 2001, Nami boarded United 93 and assisted in the hijacking of the plane, which crashed into a field in rural Shanksville, Pennsylvania, after a passenger uprising, due to the passengers receiving information from their families of the three other hijacked planes that hit the World Trade Center and the Pentagon. Nami, much like Abdulaziz al-Omari, Wail al-Shehri, Waleed al-Shehri and Mohand al-Shehri, was born in the 'Asir Province in Saudi Arabia. Born to the Quraish tribe of Saudi Arabia, Nami served as a muezzin at the Seqeley mosque after having reportedly become very religious sometime in early 1999. That autumn he left his family home in Khamis Mushayt in the summer of 2000 to complete the Hajj, but never returned – instead travelling to the Al Farouq training camp in Afghanistan where he met and befriended Waleed and Wail al-Shehri, two brothers from Khamis Mushayt, and Saeed al-Ghamdi. The four reportedly pledged themselves to Jihad in the Spring of 2000, in a ceremony presided over by Wail – who had dubbed himself Abu Mossaeb al-Janubi after one of Muhammad's companions. Dubbed "Abu Hashim", Nami was considered "gentle in manner" by his colleagues, and reported that he had a dream in which he rode a mare along with Muhammad, and that the prophet told him to dismount and fight his enemies to liberate his land. During his time at al-Farooq, there is a curious mention under Mushabib al-Hamlan's details that Nami had recently had laser eye surgery, an uncited fact that does not reappear. By October he had taken a prospective hijacker Mushabib al-Hamlan from Afghanistan to Saudi Arabia where they both procured B-1/B-2 tourist/business visas on October 28 – but Hamlan then decided not to proceed and is thought to have returned to his family. Nami's visa application has since been reviewed, and while he mentioned that Mushabib will be travelling with him, he listed his occupation as student but failed to provide an address for his school, and listed his intended address in the United States merely as Los Angeles – in the end he never used this visa to enter the United States, and reported his passport (C115007, which showed evidence of travel to Afghanistan) as "lost", and procured a new one from Jeddah (C505363). He used the new passport to acquire a new B-1/B-2 visa in Jeddah on April 23, again recopying his answers from previously although crossing out the lines regarding Mushabib and previous attempts to acquire a visa. He was interviewed by a consular officer, who again approved his application. Records at the time only recorded past failures to procure a visa, so the officer had no way of realising that Nami had successfully received an earlier visa. In mid-November 2000, the 9/11 Commission believes that Nami, Wail and Waleed al-Shehri, all of whom had obtained their U.S. visas in late October, traveled in a group from Saudi Arabia to Beirut and then onward to Iran where they could travel through to Afghanistan without getting their passports stamped. This probably followed their return to Saudi Arabia to get "clean" passports. An associate of a senior Hezbollah operative is thought to have been on the same flight, although this may have been a coincidence. While in the United Arab Emirates, Nami purchased traveler's cheques presumed to have been paid for by Mustafa al-Hawsawi. Five other hijackers also passed through the UAE and purchased travellers cheques, including Majed Moqed, Saeed al-Ghamdi, Hamza al-Ghamdi, Ahmed al-Haznawi and Wail al-Shehri. In March 2001, Ahmed al-Nami appeared in an al-Qaeda farewell video showing 13 of the "muscle hijackers" before they left their training centre in Kandahar; while he does not speak, he is seen studying maps and flight manuals. On April 23, Nami was recorded obtaining a new US visa. On May 28, Nami arrived in the United States from Dubai with fellow-hijackers Mohand al-Shehri and Hamza al-Ghamdi. By early June, Nami was living in apartment 1504 at the Delray Racquet Club condominiums with Saeed al-Ghamdi in Delray Beach, Florida. He telephoned his family in 'Asir shortly after arriving in the country. In June, he phoned his family for the last time. He was one of 9 hijackers to open a SunTrust bank account with a cash deposit around June 2001, and on June 29 received either a Florida State Identification Card or Drivers License. He may have been one of three hijackers that listed the Naval Air Station in Pensacola, Florida as their permanent address on drivers' licenses, though other sources claim he listed the Delray condominium. On August 28, Nami and Ahmed al-Haznawi reportedly bothered a Delray Beach resident, Maria Siscar Simpson, to let them through her apartment to retrieve a towel that had fallen off their balcony onto hers. On September 5, Nami and Saeed al-Ghamdi purchased tickets for a September 7 flight to Newark at Mile High Travel on Commercial Boulevard—paying cash for their tickets. Ziad Jarrah and Ahmed al-Haznawi also purchased tickets for the same flight from Passage Tours. On September 7, all four Flight 93 hijackers flew from Fort Lauderdale to Newark International Airport aboard Spirit Airlines. On September 11, 2001, Nami arrived in Newark to board United Airlines Flight 93 along with Saeed al-Ghamdi, Ahmed al-Haznawi and Ziad Jarrah. Some reports suggest Haznawi was pulled aside for screening while others claim there is no record of whether any of the four were screened; the lack of CCTV cameras at the time has compounded the problem. Nami boarded the plane between 7:39 am and 7:48 am; seated in First Class 3C, next to Saeed al-Ghamdi. Due to the flight's routine delay, the pilot and crew were notified of the previous hijackings and were told to be on the alert, though within two minutes Jarrah had stormed the cockpit leaving the pilots dead or injured. At least two of the cellphone calls made by passengers indicate that all the hijackers they saw were wearing red bandanas, which some have questioned may have signified an allegiance to the Egyptian Islamic Jihad. The calls also indicated that one of the men had tied a box around his torso, and claimed there was a bomb inside; it is not known which hijacker this was. Passengers on the plane heard through phone calls the fates of the other hijacked planes, and organized a brief assault to retake the cockpit. The hijackers crashed the plane into the Pennsylvanian countryside rather than cede control of the plane. All aboard died. After the attacks, an employee of Saudi Arabian Airlines named Ahmed al-Nami came forward to say that he feared his identity had been stolen, although he had never lost his passport. He has been portrayed by British actor Jamie Harding in the 2006 film United 93 and Asim Wali in the film Flight 93. ^ Sennott, Charles M. (3 March 2002). "Before oath to jihad, drifting and boredom". Boston Globe. Archived from the original on 8 December 2002. Retrieved 7 December 2018. ^ Eldridge, Thomas R.; Ginsburg, Susan; Hempel II, Walter T.; Kephart, Janice L.; Moore, Kelly (2004). Accolla, Joanne M.; Falk, Alice (eds.). "Staff Monograph on 9/11 and Terrorist Travel" (PDF). 9/11 Commission. p. 233. Retrieved 7 December 2018. ^ "Page 542". Faqs.org. Retrieved May 3, 2010. ^ Murphy, Caryle; Ottaway, David B. (September 25, 2001). "Some Light Shed On Saudi Suspects". The Washington Post. Archived from the original on 24 February 2011. Retrieved April 23, 2010. ^ "Chapter 2- Chronology" (PDF). National Commission on Terrorist Attacks upon the United States. pp. 6–44. Retrieved May 3, 2010. ^ Tobin, Thomas C. (1 September 2002). "911: Florida: terror's launching pad". St. Petersburg Times. Archived from the original on September 5, 2002. Retrieved May 3, 2010. This page was last edited on 21 March 2019, at 11:51 (UTC).